Make your bedroom your private sanctuary with the Amish Le Chateau Calais Sleigh Bed. This style is similar in design to the classic French Louis Philippe pieces. Made of 100% solid wood in the USA! The Amish Le Chateau Calais Sleigh Bed has a high headboard and uniquely designed lower footboard, both with four raised panels. It is available in oak, cherry or maple wood and handcrafted by experienced woodworkers in Lancaster, PA. Give your bedroom the look and comfort of a village inn with the Le Chateau Calais Sleigh Bed. For added strength and support, screws are used to attach the side panels on the sleigh beds. The rails are then bolted together with a through bolt and barrel nut. Each bed has five slats of which two have center supports on the queen and king beds. This product takes about 8-12 weeks to complete. 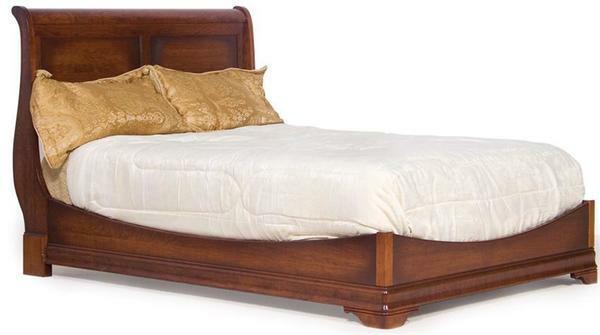 If you have any questions about this bed or any of our other products, please give us a call at 1-866-272-6773. One of our Amish Furniture specialists will be happy to assist you with anything you need! Thank you for shopping with DutchCrafters.